The Oilfield Biocides Market and the Bio-solvent Market are important Markets global markets and are estimated to be worth around $345.8 Million and $126.2 Million respectively as of 2017and are expected to grow with a CAGR of 5% and 4.6% respectively during the forecast period from 2018 to 2023. The Market is fragmented by BASF and Dow Chemicals where BASF has 23% of the global Market share and Dow Chemicals has 41% of the global market share. These two are the key players in the whole market. Region wise North America is the Market leader for Oilfield Biocides and Bio-Solvents followed by Europe then Asia and then the rest of the world. In Oilfield activities and essentially during drilling and oil recovery, microorganisms can have a severe impact on the oil recovery process due to microbial corrosion of the equipment and the piping systems and by formation of bio-films on the walls of storage tanks, pipe systems and on the filters and valves thus plugging the flow and causing degradation of the oilfield chemicals being used and corrosion of the pipes. Hence Biocides are used to kill these micro-organisms so as to prevent these situations. Bio-Solvents are used in Oilfield Operation during Enhanced Oil Recovery processes as well as cleaners for oilfield equipment. Biocides are classified based on their production sources as either Synthetic or Natural Biocides. Bio solvents are generally made from renewable feed stock thus making them environmental friendly, there is research being done on the production of microbial bio-solvents as well which can be used in oil recovery activities. Application of biocides in oilfield activities include its injection during oil recovery, fracking, drilling, pit treatment and many more. Application of bio-solvents in the oilfield operation include during Enhance oil Recovery and during cleaning of equipment part to remove mud, soil, grease, polymers and other residues. Growth driver for the biocide and bio-solvent market in the Oil and Gas industry is the increase in oil exploration, fracking and oil recovery activities due to the increasing global population and the increasing demand for fuels. Another growth driver for bio-solvents is the strict regulation on Volatile Organic Compound (VOC) content in different materials, since bio-solvents are made from renewable feed stocks they contain low or no VOC’s thus making them a greener and environment friendly alternative. One major challenge for the Biocide and Bio-Solvent industry in Oilfields is the shift from crude oil to other renewable sources for various applications including fuel production and the rising market for Oleochemicals replacing the petrochemical demand. This effects the Oilfield biocide and bio-solvent Market adversely as the consumption of crude oil reduces thus directly effecting the demand for Biocides and Bio-Solvents in Oilfield Operations adversely. The base year of the study is 2017, with forecast done up to 2023. The study presents a thorough analysis of the competitive landscape, taking into account the market shares of the leading companies. It also provides information on unit shipments. These provide the key market participants with the necessary business intelligence and help them understand the future of the Oilfield Biocides and Bio-Solvents Market. The assessment includes the forecast, an overview of the competitive structure, the market shares of the competitors, as well as the market trends, market demands, market drivers, market challenges, and product analysis. The market drivers and restraints have been assessed to fathom their impact over the forecast period. This report further identifies the key opportunities for growth while also detailing the key challenges and possible threats. The key areas of focus include the types of plastics in the electric vehicle market, and their specific applications in different types of vehicles. Oilfield Biocides and Bio-Solvents Market– by Type of Biocides and Bio-Solvents: Biocides: Oxidizing, Chlorine, Peracetic Acid and others; Non-Oxidizing: Glutaraldehyde, Quarternary Ammonium, Tetrakis hydroxymethyl Phosphonium, 2,2-dibromo-3-nitrilopropionamide (DBNPA) and others; Bio-Solvents: Hydrocarbons, Alcohols, Glycols, Esters, Ethers and others. 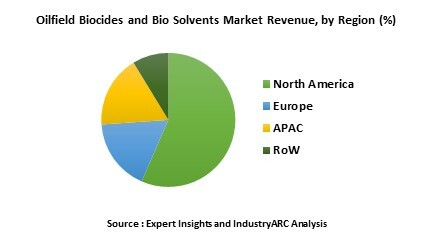 Oilfield Biocides and Bio-Solvents Market– By Source: Synthetic Biocides, Natural Biocide, Microbial Bio-Solvents, Renewable feedstock for Bio-Solvents and others. Market– By Applications: Drilling, Production, Hydraulic Fracturing, Completion, Packer Fluids, Pit Treatment, Enhanced Oil Recovery, Degreasing and Cleaning of Equipment and others. Oilfield Biocides and Bio-Solvents Market – By End User Industry: Oil and Gas Industry. Some of the Key players in this market that have been studied for this report include: Dow chemicals, BASF, Solvay, Croda Chemicals, Nanotera Group, Stepan Company, Nalco Champions, Seatex Corp., Ashburn Chemicals, Pilot Chemicals and many more. The rising awareness to air quality and air pollution has led many governments in the recent years to put strict regulation on VOC solvents and their use in various application. This trend has been a major booster for the growth of Bio-Solvents and has hence also led to a trend of R&D and production of Bio-Solvents with very low or zero VOC content. The Biocide market has been seeing a trend of small and medium sized companies leaving the market due to the strict regulation placed on the production, use and release of biocides due to their highly toxic nature that effect the environment and micro-organisms in them. There has also been in increase in Oil drilling activities many new drilling sites being explored and operation taking place. This trend in the Oil and gas industry coupled with the trend in the operations of hydraulic fracturing for the production of Natural gas is also a major positive for the Oilfield Biocide and Bio-Solvents Market, though there is an equal push back seen for these activities from the environmentalists.